Interpret our "Hit the Road Jack" piano sheet music. Originally composed and recorded by Percy Mayfield in 1960, this mythical blues song was made famous by the unforgettable cover version by Ray Charles and Margie Hendricks. It is one of the jazz man's greatest hits. Discover this immense standard with our piano arrangements in several levels of difficulty, from easy piano Level 1 to Level 3 for more experienced pianists. 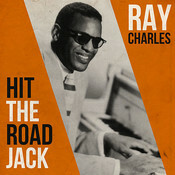 With "Hit the Road Jack", Ray Charles won the Grammy Award for Best Rhythm & Blues Song in 1962.